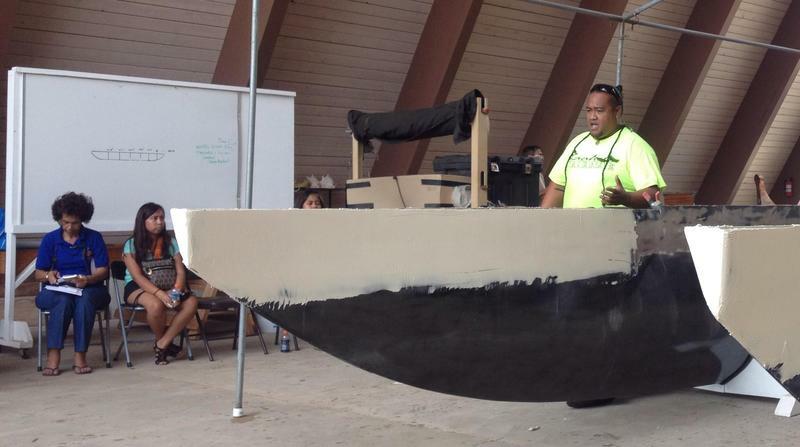 A traditional Tokelauan canoe or vaka is taking shape in Wahiawa. Tokelauan master carver Vasefenua Reupena is seen here wielding an adze or toki as he chips away at the albezia log. 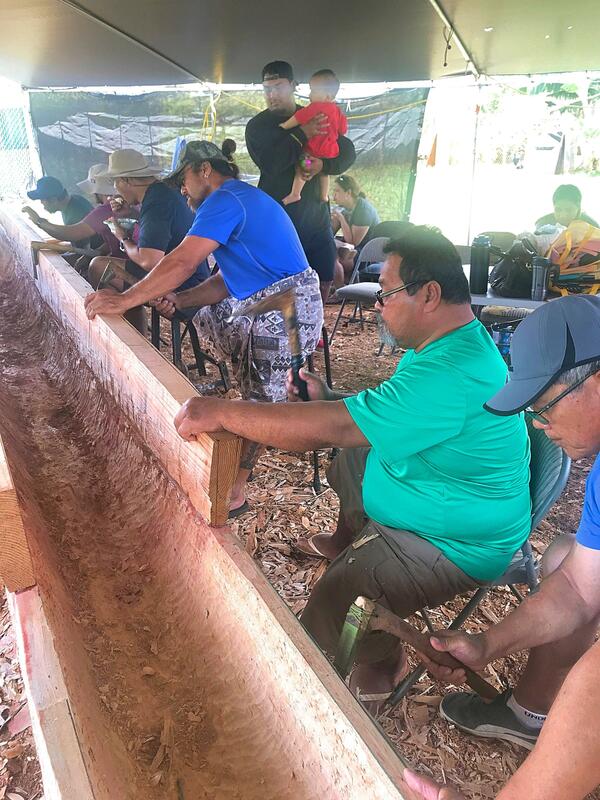 Under a canopy tent in the old plantation village of Poamoho in Wahiawa, a half dozen or so men use traditional Tokelauan adzes called toki to chip away at a 35-foot long log of albezia. Women and children encourage the carving in song as the canoe is beginning to take shape. The canoe carving project is about four weeks in, and halfway to completion. Men are seen here wielding Tokelauan adzes called toki. Tokelauan master carver Vasufena Reupena says they’re about half way done. Carving should be complete in about five weeks. Reupena traveled 2,500 miles to Hawai’i from his native Tokelau – a small island nation in the South Pacific. He’s here to lead the local Tokelauan community in constructing a traditional canoe. “It is the wind in the sails of many of us,” says Bonnie Patelesio, a teacher and the co-director of Te Lumanaki, a Tokelauan language program in Wahiawa. The carving project is the centerpiece of Te Lumanaki’s efforts to engage the younger generations of local Tokelauans. A little over a dozen or so students some as young as 3 years old sit under the tent reviewing Tokelauan words for the different parts of the vaka or canoe. The lessons are taught by Reupena entirely in Tokelauan. 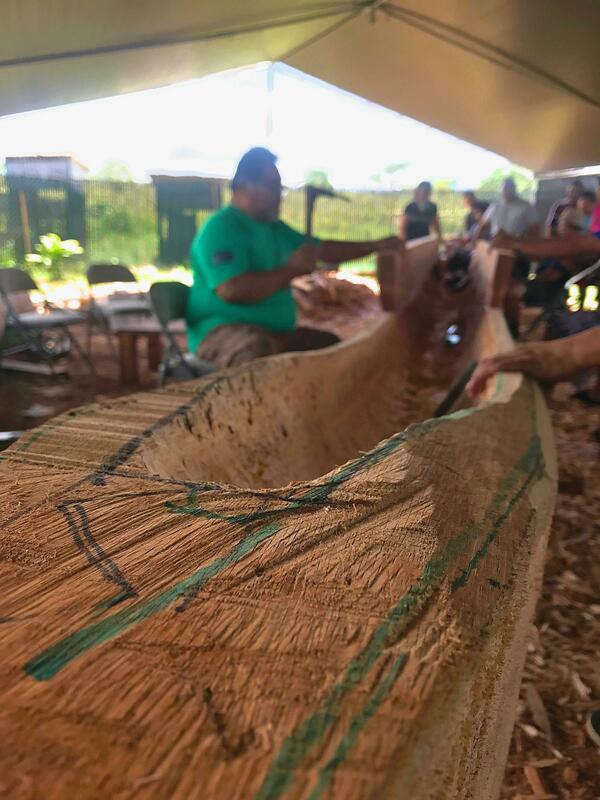 A tent set-up for canoe carving becomes a makeshift classroom for a dozen or so students of Te Lumanaki, a Tokelauan language and cultural program in Wahiawa. Her classmate, 29-year-old Hita Tulano, on the other hand, is quick to speak up even if she doesn’t know the answer. PATELESIO: Give me a hint, give me a hint. 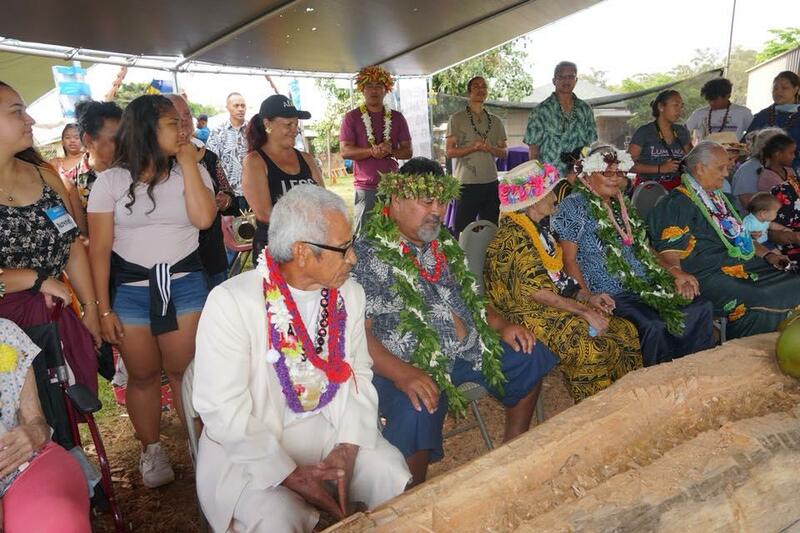 Local Tokelauan elders joined Reupena at a blessing ceremony for the future canoe. Tulano and Ickes both have their roots in Tokelau – a remote group of atolls north of Samoa. 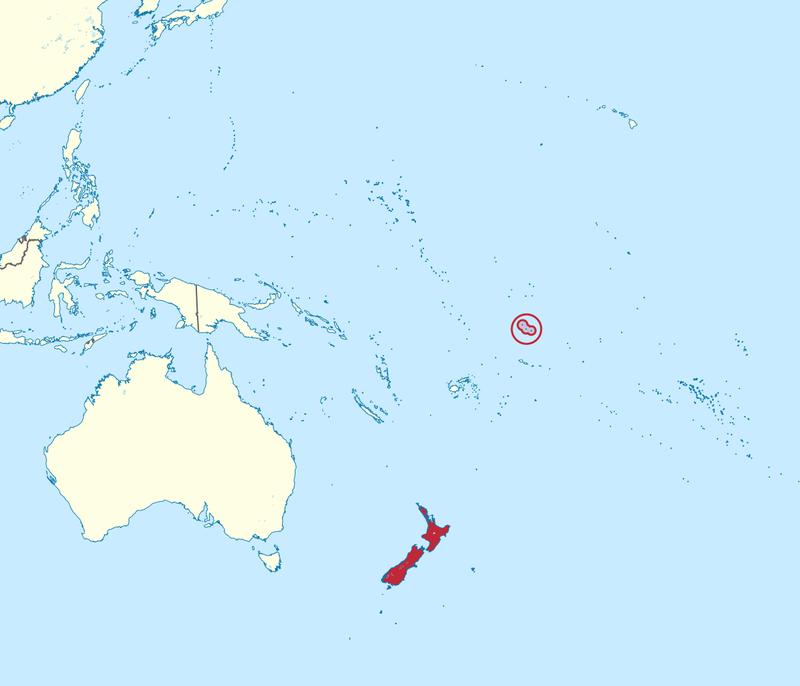 About 1,500 people live in Tokelau today. An estimated 10,000 Tokelauans exist worldwide, including nearly 1,000 here in Hawaiʻi. Most are descendants of migrants who came here to work the pineapple fields in the 1960s. “Our elders were getting to that point that they werenʻt going to be around much longer,” says university professor Betty Ickes, the founder and Executive Director of Te Taki Tokelau. 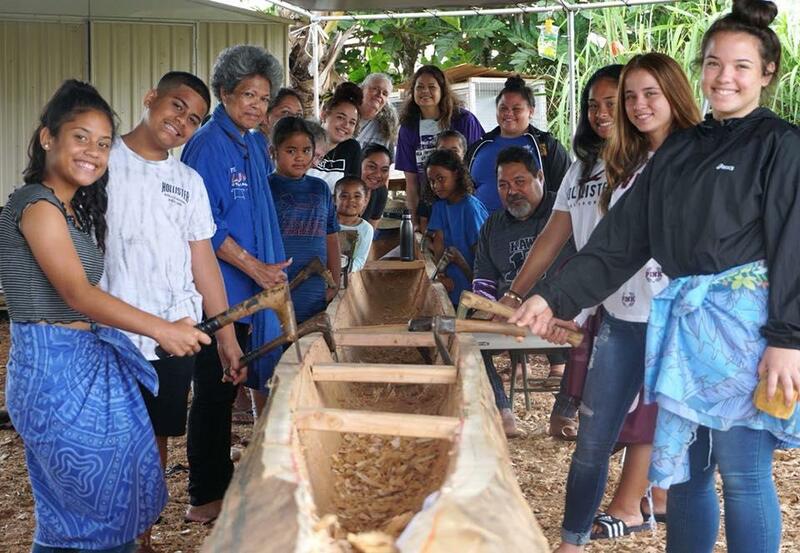 Betty Ickes (second from left) is seen here in a photo with Te Lumanaki students at the canoe carving site. As we reported earlier this week, New Zealand Prime Minister Jacinda Ardern is on a tour of the South Pacific to promote what she calls a “Pacific Reset.” The new prime minister pledged millions to help Samoa and Tonga recover from Cyclone Gita. But, as we hear from Neal Conan in today’s Pacific News Minute, New Zealand must still repair relations with one of its own territories.